With my new appointment and move back to the North Island I will soon be no longer able to contribute to this blog as I have been doing. I would still do some posting the occasional airline profile. Is their anyone out there who might be interested in having an active role in maintaining the blog??? Whichever airline ends up replacing Air New Zealand on the Kaitaia-Auckland route, the town's air passengers are likely to end up with a better timetable. One of the gripes about the current twice-daily Air New Zealand service is that the morning flight leaves too late for business travellers to get a full business day in Auckland. As a result many drive the extra hour to Kerikeri to catch an early flight. However, Tauranga-based Sunair - one of four airlines now vying to fly the route - says it would base an aircraft and two crew at Kaitaia. That means its first flight could leave at 7am, guaranteeing a full day in Auckland, and return about 9.30am. A second return flight could leave about 4-5pm. Sunair owners Dan and Bev Power were in Kaitaia on Friday to meet airport operators Far North Holdings, Kaitaia business representatives, and the Chinese owners of a major tourism venture on Karikari Peninsula. Auckland-based company Inflite was also in town on Friday, making use of a charter flight to Kaitaia to show off its plane and give a few lucky locals a free flight to Auckland. Two more companies are understood to be interested in flying from Kaitaia but their identity is still under wraps. Mr Power said his company would use its nine-seater Piper Chieftain or, as long as the business plan stacked up, buy a 12-seater Cessna Caravan. The level of landing fees charged at Kaitaia would be one of the crucial factors in deciding whether the plan had wings. It was too early to say what flights would cost but a one-way ticket was likely to be similar to the current Air New Zealand fare. Reaction to the firm's proposal had been very positive, Mr Power said. "Being somewhat remote the local community requires an air service. There's some nervousness about the possibility of not having one - we're here to allay those fears." Mrs Power said the feedback so far had included one particularly heart-warming letter from a Kaitaia GP who told them how much medical services depended on flights to Auckland and Wellington. If there were no Kaitaia flights it would be even harder to persuade good staff to live in the very Far North, the GP said. While in Kaitaia the Powers met airport staff and Far North Holdings chief executive Andy Nock, Kaitaia Business Association representatives, and the owners of Carrington Estate where a huge hotel development is planned. Meanwhile, Inflite's 19-seat Jetstream 32 dropped into Kaitaia on Friday afternoon with 16 Chinese passengers heading to Carrington Estate. The plane had been due to return empty to Auckland so the firm offered the seats free to Kaitaia's business community and, via a GP, locals who needed to get to Auckland but could not afford to fly. The remaining seats were offered to Age readers who phoned in after last week's story. In the end only Bruce and Chris Buckby seized the opportunity, flying to Auckland to visit elderly parents before making their own way home to Kaitaia. Inflite is the only third-level airline already operating planes of the same size as the Beechcraft 1900D Air NZ uses on the Kaitaia run. It also plans to offer early-morning flights if its bid is successful. Air New Zealand's last flight out of Kaitaia is on April 28. 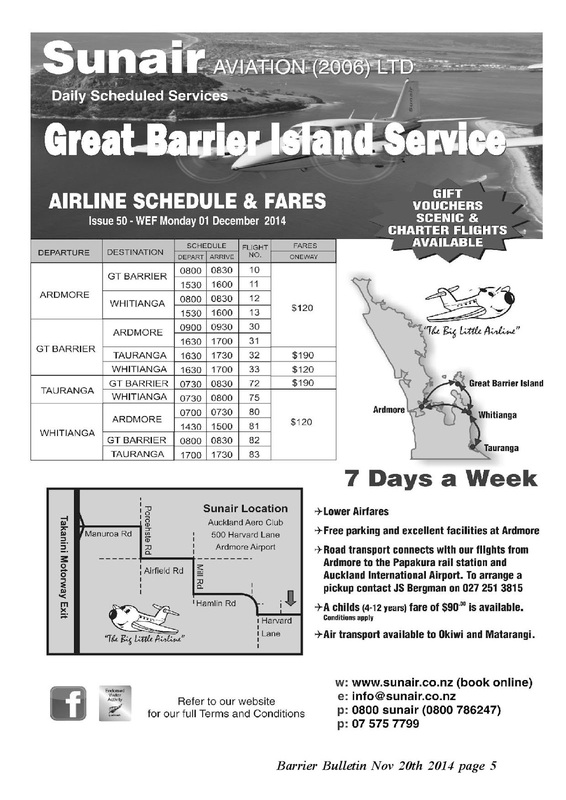 Sunair's new service between Auckland's Ardmore and Great Barrier Island and Ardmore and Whitianga is set to start next week as advertised in the latest issue of the Barrier Bulletin. This particular project is being fronted by Ryan Bergman who has excellent credentials for the job, being the son of Jim & Ruth of GBA fame. He spent a couple of days on the Barrier last week doing the rounds and is very enthusiastic. Sunair seem keen to get the formula right with free parking at Ardmore and free ground transport to connect with the trains at Papakura station being provided. Sunair will also operate to Great Barrier's Okiwi airfield and the Coromandel's Matarangi airfield. Sounds Air Travel and Tourism Ltd, trading as Soundsair, have taken delivery of their 5th Cessna Caravan with the arrival at their Omaka maintenance facility 24 November of Grand Caravan N771AL. The low-timed Garmin 1000 equipped turbine is set to be repainted into the airline's colours and be registered ZK-SAW. The arrival of ZK-SAW sees the NZ population of Grand Caravan's grow to 7 with an 8th example, destined for parachute operations and fitted with a Garrett turbine engine, is currently on its delivery flight from the USA to NZ and due mid week. After catching Air Chathams' Convair ZK-CIF departing Timaru last week http://3rdlevelnz.blogspot.co.nz/2014/11/take-off-from-timaru.html I was delight to get ZK-CIB departing Wellington on 19 November 2014. Looking forward to seeing the map on the tail again ! Sunair's chief executive Dan Power flew into Whakatane earlier this week to talk to representatives from the Whakatane District Council and the Eastern Bay Chamber of Commerce. Initially Sunair was looking at operating two scheduled daily return services between Whakatane and Auckland using a Cessna Caravan. Sunair is also offering to provide connections to Gisborne and Napier but their last attempt to include Whakatane didn't generate much traffic. Dan Power said “We wanted to gain from the business community what they want from an air service so we’ve got local input and can work on schedules and prices.” A survey is planned for the business community and Air New Zealand has provided Sunair with statistics on the Whakatane-Auckland route. This seems to indicate four return flights a day would be needed, not two. If it extended its operation to Whakatane, Sunair would have a base at the airport and two pilots living in the community. Meanwhile locally-based East Bay Aviation is interested in expanding their businesses to include scheduled flights to Auckland. A third unnamed company is also looking at servicing Whakatane. Inflite Charters Limited is opening a new base at Taupo Airport. In conjunction with well-known local operators, Toby and Cushla Clark, and Vaughan Nairn (Base Manager), Inflite are delighted to be expanding helicopter and charter plane services into the Central North Island region. The new operation will be based at the Izard Air complex at 1159 Anzac Memorial Drive, Taupo Airport. This stunning facility, built by Richard Izard, is well suited for Inflite’s operations and allows a great opportunity for growth, as the business establishes in the region. Scenic helicopter flights, lodge transfers, golfing, fishing and vineyard trips are available immediately in our AS355 Twin Squirrel and Robinson R44 helicopters. Our helicopter flights can operate from the Taupo Airport and Taupo harbour-side helipads, as well as regular private landing locations. With the enhanced safety of twin-engine performance, the Squirrel AS355 offers a roomy and comfortable cabin capable of accommodating up to five passengers. This very sought after helicopter is especially appreciated for its VIP, corporate and tourist flight capabilities. The Robinson R44 helicopter comfortably carries up to three passengers, and offers excellent visibility through the bubble canopy, making it an ideal aircraft for exploring the stunning mountain, geothermal and lake scenery. Having high quality and reliable helicopter and charter plane services in this thriving business community and energetic tourist destination is imperative, and Inflite look forward to providing exceptional service to locals and visitors alike. Further announcements will be made shortly regarding new scenic flight products and packages, charter plane options. Air New Zealand's attempts to defend its decision to pull out of the Taupo-Wellington route have been labelled a "waste of time" by those attending a meeting with businesses in the tourist town. The meeting was held yesterday after the airline announced cuts to its regional services. Air NZ chief sales and commercial officer Cam Wallace told the crowd of about 50 people that using the 19-seater aircraft being phased out lost the company $26 per person per flight. This resulted in a $1 million loss each month, and it was not economically viable to offer the larger 50-seater service. "Taupo to Wellington - that's not a market, we don't want to be in [it]." But those present struggled to understand how the service was not financially viable, with some asking why an Auckland-Taupo-Wellington route could not be added. But these ideas didn't fly, with Air NZ reps drawing attention instead to the benefits of the Auckland route. Taupo District Council member and business owner Rosie Harvey said she was sick of it being "all about Auckland". "We're [Taupo] the events capital of the North Island. It's time we were looked after." Wallace made it clear Air NZ had no interest in re-entering the Taupo to Wellington market, stating its future was more looking at different options for the route. "We are more than supportive of any player coming in, and more importantly we will help support them." Mayor David Trewavas said the council had had a few approaches from people looking to step in. Wairaki resort manager Kathy Guy said with the Wellington flights ending from April 2015, and the Auckland to Taupo flights not going to 50-seaters until February 2016, the region was being left short. "Our business had a huge exponential increase, now this has been a real blow for us. " . . . Trying to get people into Taupo has become so difficult, they're saying, 'it's all too hard and we're going to go somewhere else'." Another aviation firm has put its hand up to fly the Kaitaia-Auckland route in the wake of Air New Zealand's shock announcement it plans to pull out of the Far North town. Inflite, an Auckland charter company with two 19-seater aircraft and a history of flying to the Far North, contacted the Far North District Council and Far North Holdings this week to signal its interest. The company had already been approached by councils in other towns which have lost air services in earlier cutbacks by the national carrier. Inflite's advantage is that it is the only third-level airline already operating planes of the same size as the Beechcraft 1900D Air New Zealand uses on the Kaitaia run. Tauranga-based Sunair Aviation, the first company out of the blocks, has a fleet of six-seater Pipers but is considering leasing a 12-seater Cessna Caravan if it wins the right to fly the Kaitaia route. Inflite charter manager Paul Aston said it was still early days and the company needed to work out whether the level of demand warranted daily flights or three a week. "On face value it stacks up. If it does, we'll be in, boots and all. The fit for us in Kaitaia is very strong, more than in other regions." Inflite specialises in corporate and tourism charters using its two Jetstream J32EP aircraft. It has previously flown between Kaitaia and Auckland as a back-up for Air New Zealand and has good links with the Far North tourism industry. Mr Aston said it was too early to say what flights would cost but there were likely to be only one or two fare levels, unlike the complex multi-level system used by Air New Zealand. The departure time could be adapted to Kaitaia's needs. Inflite is flying to Kaitaia on Friday with 16 charter passengers and returning on Saturday to pick up another 12. The twin-engined Jetstream turboprop will be parked on the runway in Kaitaia from about 4-5pm on Friday for anyone who wants a look. With the plane originally due to fly back empty the company has offered the seats free of charge to members of Kaitaia's business community and, via a GP, Kaitaia residents who need to get to Auckland this weekend but cannot afford to fly. A very limited number of seats are left. Anyone who wants a free one-way flight to Auckland, departing about 5pm on Friday, can call Mr Aston on 027 230 4407. First come, first served. Wanganui needs to heed the message that comes with Air New Zealand's decision to change the way it will be flying to and from regional centres in the next six months. Unprepared to continue carrying rising costs, the airline has called time on the Eagle Airways' Beech 1900D aircraft that flies to 15 regional cities and towns. The harshest blow has been delivered to Kaitaia, Whakatane and Westport, which lose their services altogether. In the reshuffle, Air NZ will gradually phase out the Beech 19-seater turbo props, replacing them with the 50-seater Bombardier Q300 planes and Wanganui will see the first of them on a regular service from April. From February 2016, the Beech will no longer come here, with the Bombardier taking over the service completely. Air NZ chief executive Christopher Luxon told the Chronicle that while they were tough calls, rising costs and increasing losses on the regional routes called for drastic action. Mr Luxon said independent research showed the national carrier provided a good regional service by world standards but the economics of running the service "are really tough". "We have three regional airlines running three different turbo-prop fleets. Mt Cook operates 68-seat aircraft, Air Nelson operates 50-seat aircraft and Eagle Airways operates 19-seat aircraft," he said. "But over the past five years the cost of operating our regional services has increased significantly." Mr Luxon said fuel costs were up 14 per cent, navigation charges had climbed 23 per cent and the company was paying 46 per cent more in airport charges. "These three costs alone account for 40 per cent of our regional cost base, yet we've worked very hard not to pass these increases on to our customers. In fact, our average regional fare is down two per cent in nominal terms over the same period and that's more than 10 per cent when adjusted for inflation." He said the difficulty was simply one of seats and their take-up, and the 19-seat Beech planes - the smallest aircraft in the fleet - were the dearest to operate on a costs-per-seat basis. "Eagle Airways has been losing more than $1 million a month for the past two years. That's the equivalent of losing $26 on every one-way ticket sold." But he said even taking these economic realities into account, there was still a perception that regional fares were unjustifiably high. "In some cases, customers just aren't willing to pay what it costs to operate to their town. There's also been a suggestion that our recent strong commercial result has come at the expense of the regions. This is simply not true." He said Air NZ's improved annual result was largely due to the turnaround of its international network. And he said it was that turnaround that was giving the company the leverage to reinvest in its regional fleet. As a result, it has ordered four new 68-seat Mt Cook aircraft worth $100 million, bringing the total spend on new aircraft for that fleet to $300 million over the past four years. Mr Luxon said it means the airline would be putting the larger planes on to routes where the demand was greater, and moving the remaining routes to 50-seat aircraft, where there was sufficient customer demand. "These aircraft have significantly better operating economics, partly because fixed costs can be spread across more passengers," he said. He said this better "seating economics" meant fares on the regional routes, including those like Wanganui being serviced by the Bombardier Q300s, would drop 15 per cent. "That's exactly what's happening in Wanganui. From February 2016, Wanganui customers will be able to access services in larger aircraft and benefit from cheaper fares." The Bombardier service would increase the number of seats available between Wanganui and Auckland by 75 per cent. Mr Luxon made it clear that some smaller markets that struggled to support a 19-seat operation could not be expected to provide sufficient demand to support 50-seat planes. It was on this basis that those three towns have been cut from services altogether, while a number of other services will end in April. While Mr Luxon is not saying it in so many words, the message to Wanganui is clear enough - use it or lose it. Two aviation companies are now vying for the right to fly from Kaitaia after Air New Zealand's shock decision to quit the Far North town. The national carrier announced last week it would axe its Kaitaia flights as of April next year, a decision decried by business, farming, health and political leaders. Tauranga company Sunair Aviation was the first to throw a lifeline to stranded Far North air travellers but a second, as yet unnamed company is also keen to take Air New Zealand's place. Far North Holdings chief executive Andy Nock said the council-owned company was evaluating two proposals for a Kaitaia air service to make sure the town got the best flights possible in terms of capacity and departure times. The offers were confidential for now. The upside of Air New Zealand's withdrawal was that Kaitaia could end up with a better service for business travellers with earlier departures and later returns, Mr Nock said. 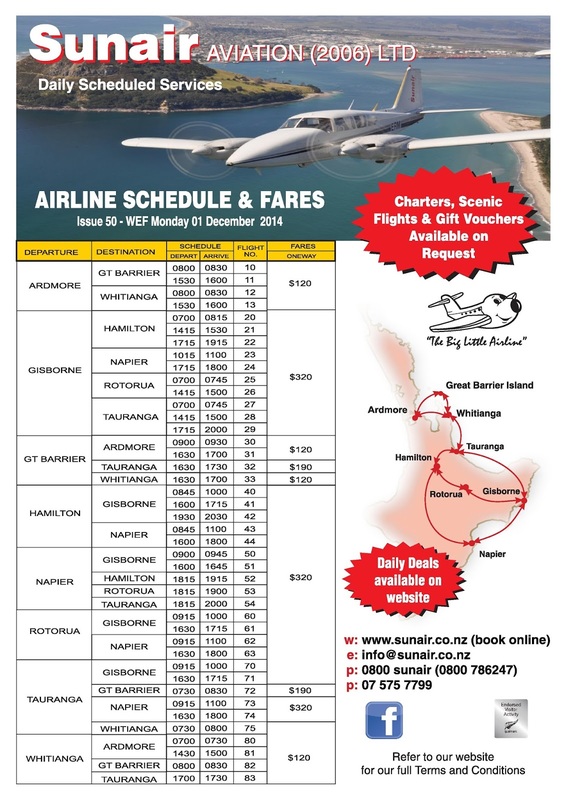 Sunair, which specialises in routes between provincial towns not flown by the national carrier, was the first to contact the Far North District Council and Far North Holdings. Its aircraft - mainly twin-engined, six-seater Piper Aztecs - are even smaller than the 19-seater Beechcraft 1900Ds Air New Zealand says are too small to be economic, but the firm believes its lower overheads will make the route viable. Describing itself as "the big little airline", Sunair has 10 twin-engined aircraft serving eight regional towns and is owned by Tauranga couple Dan and Bev Power. Mrs Power said Sunair would offer two flights a day timed to allow a full business day in the destination city. The number of flights could be increased if there was sufficient demand. It was too early to give an indication of cost but she hoped they would be similar to current Air New Zealand fares. The company had already spoken with Mayor John Carter and Mr Nock. Both were enthusiastic and supportive, she said. The level of airport fees charged, and choosing the right size aircraft, were crucial to making the service viable. The firm was considering bringing in 12-seater Cessna Caravans. Mrs Power said there was a social obligation to ensure Kaitaia continued to have air transport but but it also had to work financially. "We see this as a business opportunity. We think we can make it work, we have less costs, less overheads than Air New Zealand." One of the complaints about the current service is the departure time, with some Kaitaia business people saying they have to drive to Kerikeri to catch an early flight and get a full day in Auckland. Mrs Power said the departure time had yet to be set but would have to fit in with other flights. "Each region wants the early departure. We'll take that on board and try to make it work as best we can." It is not the company's first attempt at setting up an air service in Northland. In 2007 Sunair tried to start up a Whangarei-Auckland service in alliance with Whangarei air training school Quantum Aviation. It folded a few months later because a government policy change meant Quantum's students were no longer eligible for student allowances or loans, and because the company struggled to compete head-to-head with Air New Zealand. The 25-year-old company currently flies from Hamilton, Tauranga, Rotorua, Napier, Gisborne, Whitianga, Great Barrier and Auckland. It has also offered to replace Air New Zealand's Whakatane flights. Mr Carter said the council would do everything it could to retain daily flights from Kaitaia, which were an important part of the Far North's transport infrastructure and helped keep Te Hiku on the tourist map. Northland MP Mike Sabin said he was heartened to hear of Sunair's plans following Air New Zealand's shock announcement. He had spoken with the company's chief executive, who told him Air New Zealand would work with the replacement airline and airport operators to ensure a smooth transition. - An aviation insider describes Sunair as "a quiet achiever" which has survived 25 years in a tough industry by "keeping out of the way of the big boys" and avoiding major incidents. However, if Sunair were to take on the Kaitaia route it would probably need a larger aircraft such as the 12-seater Cessna Caravan. Other third-level airlines being discussed in aviation circles as possible replacements for Air New Zealand on the Kaitaia, Whakatane or Westport routes include Paihia-based Salt Air, Whakatane-based East Bay Aviation, Great Barrier Airlines, Fly My Sky, Wellington's Sounds Air and Auckland corporate flight specialist Inflite Charters. Salt Air operated daily flights between Kerikeri and Auckland's North Shore from 2008-12. Far North Holdings chief executive Andy Nock is right on the button. Kaitaia might have a far better service with another operator with better times for Kaitaia business people. A good example is Sounds Air on Wellington-Wanganui route. Air NZ operated one Beech 1900 flight each day... Sounds Air started off offering one flight a day and has subsequently increased it to two flights each day. The service is still building but Sounds Air is able to be more flexible and attuned to the community's need in a way Air NZ is not. Negotiate well Kaitaia! No talk on a Caravan... will Aztecs inspire confidence? Airport charges are a big part of the reason for high regional airfares, says Dan Power, the chief executive of regional airline Sunair Aviation, which is looking to pick up Air New Zealand's abandoned routes. The Tauranga-based airline is looking to start flights to Kaitaia and Whakatane, after the national carrier flagged it will end operations from the regional airports next year, citing lack of patronage and high costs. Sunair has been operating for the past two decades, offering regular twice or more daily flights on its 15-plane fleet between regional North Island hubs like Hamilton, Gisborne, Rotorua, Whitianga and Napier. "Air New Zealand is very strong in the regional market and it's a very good operator and quite a formidable competitor, should you want to make it one," Power told BusinessDesk. "Due to its strength in the market place, certainly Sunair would not want to compete with Air New Zealand. "For us to take on routes being exited by Air New Zealand in the North Island is not difficult for us," he said. Most travellers on Sunair are businesspeople flying between regional centres, which would be the kind of service Sunair would operate for Kaitaia and Whakatane. Sunair hasn't begun formal negotiations with Kaitaia or Whakatane airport, which are both owned by the local councils, but said airports had a role to play if they wanted to keep regional routes. "I think small airport owners, which are usually the councils, have to start treating airports as amenties to their communities as they used to, and maybe step back from trying to make them a revenue-earning part of the council, because it is just not working," Power said. "As the airports get less operators they charge more and more to the remaining ones and its just a never- ending spiral to oblivion." The regional airline saw opportunity where Air New Zealand saw losses, Power said. The national carrier announced earlier this month it was ditching seven regional routes, as the cost of maintaining its 19-seat aircraft fleet has cost more than $1 million a month over the past two years. Airlines pay service charges to the state-owned air controller Airways Corp, as well as landing fees to airports. Airports have an interest in keeping airfares low to boost traveller numbers. In August, the New Zealand Airports Association called on the Commerce Commission to regulate Air New Zealand's regional fares on routes where the national carrier had an effective monopoly, after it announced a 45 percent uplift in annual profit to $262 million, its third consecutive year of earnings growth. That was before the national carrier announced it was dropping some unprofitable regional routes. "The reason why, in part, Air New Zealand and other operators are beginning to really struggle with thin routes in New Zealand is simply because of the rising cost of infrastructure placed on this industry. We've seen 50 percent increases in airport charges in the last two years," Power said. "These really high costs of using airports and Airways is what's making it difficult for Air New Zealand and ourselves. People often say 'why are regional airfares so expensive?' well that's why: because our costs are so high dealing with the Airways Corporation and the airport companies." Airports themselves are regulated by the anti-trust regulator, as they're considered to have an effective monopoly and are required to disclose financial statements and business plans, as well as keeping returns under 8 percent to limit excessive profits. Frustrated Westport residents said today the Greymouth-based Air West Coast had operated a good service to Wellington, before Air NZ undercut it, forcing it out of business. Air West Coast, owned by the Gloriavale Christian Community, started flights out of Westport in 2002. In February 2007, Air NZ began twice daily services to the town, and 16 months later Air West Coast pulled the pin. Air New Zealand subsequently duplicated this service which could not economically sustain two operators. Accordingly, Air West Coast will withdraw its Westport service Air West Coast's Fervent Stedfast said at the time. It discontinued the Greymouth air service soon after. Westport has suffered hundreds of mining job losses since then, and the Holcim cement plant is earmarked to close. However, Air NZ's decision —which caught everyone off guard — has left a bad taste in people's mouths. Westport resident Bruce Hamilton said Air NZ flights did not leave until too late, at 9.10am, meaning people arrived in Wellington too late for meetings. As a result, people had been driving to Nelson to catch a plane for some time. The previous flights by Air West Coast at least gave them a decent day in the capital, Mr Hamilton said. They (Air NZ) destroyed a perfectly good service. He suspected everyone would now fly from Nelson, which was taking business out of the West Coast and giving it to Nelson". While I have no doubt competition from Air New Zealand was a factor leading to Air West Coast pulling out of Westport, it was not the only factor. When Eagle Air, who operate the service to Westport, had made more control of their operations they were wanting to improve services to Kaitaia and Westport moving them from a single flight to two flights a day. Certainly this is what the town's leaders wanted, an improved Air NZ service rather than a smaller airline. This was the concern when Air West Coast started in 2002. Initially the service saw flights from Westport to Christchurch and Wellington but the Christchurch flights were never supported and were dropped. Most of the traffic on Air West Coast came from Greymouth. People from Greymouth or Hokitika wanting to fly to Wellington had to go from Hokitika via Christchurch so a direct flight (with a brief stop over in Wellington) was preferable. About the time Eagle doubled their Westport service Air West Coast looked to introduce a 19-seat Dornier 228 to the run. But as it was being introduced Air West Coast was expressing a warning... The Greymouth Star of 8 March 2007 reported that "Air West Coast has bought a bigger plane (the 19-seat Dornier 228) to match Air New Zealand Link operator Eagle Air, but may pull out of Westport if patronage doesn’t improve... We believe that there will be enough traffic out of Greymouth to fill up the plane. (But) We’ll stick with Westport for a wee while to see how it goes by putting on this big plane, and see how the customer acceptance is and we’ll evaluate it as we go." I flew Air West Coast twice, one southbound in the Chieftain... with no passengers for Westport and once northbound in the Dornier... we had about 14 passengers and stopped to pick up 1 at Westport. On the 27th of June 2008 Air West Coast stopped calling at Westport on the flights to and from Wellington. 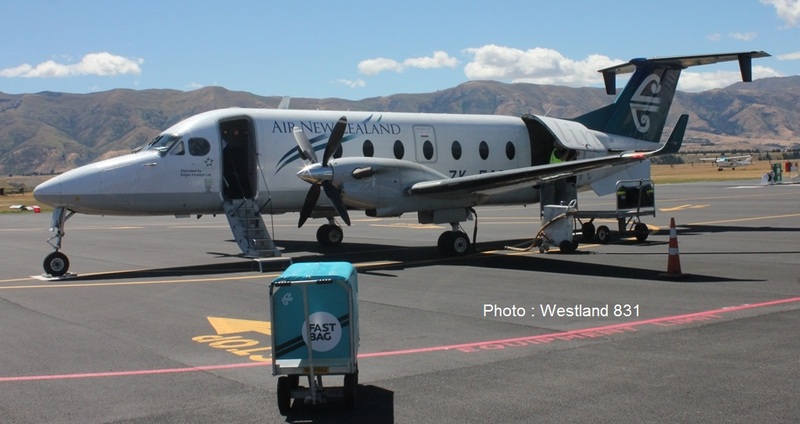 Chief executive Fervent Stedfast said "Air West Coast established a morning and evening return air service to Wellington to benefit Westport people. Air New Zealand subsequently duplicated this service which could not economically sustain two operators. Accordingly Air West Coast will withdraw its Westport service. The airline had been running Monday to Friday from Greymouth-Westport-Wellington in the mornings, returning in the evenings. However, patronage had been slow and some days it did not come into Westport because there were no bookings. It would still be flying Greymouth to Wellington as it had no competition in Greymouth." Six weeks later the Greymouth to Wellington service ceased with Air West Coast citing increased costs, including a massive increase in fuel costs over the previous year, eventually making the venture uneconomic. From what I understand the overheads to have all the CAA regulations meant were also a huge expense for Air West Coast. Air West Coast operated a single route - northbound to Wellington in the morning and a return service to the Coast in the late afternoon. That meant the plane and pilots were sitting around doing nothing all day... not a good scenario for an expensive machine. Potential airline operators beware! Soon after Coastair started services from Christchurch to Westport via Greymouth if there were passengers offering. The service built really slowly but was building until Air New Zealand introduced a twice daily Monday and Friday service between Christchurch and Westport. There was a lot of cries about Air NZ with this but they had been in dialogue with Solid Energy for sometime about providing a service. Solid Energy staff were not allowed to fly in unpressurised aircraft after the fatal Air Adventures' Piper Chieftain crash at Christchurch. Air NZ only started the service when Solid Energy guaranteed a set number of seats per flight. Sadly this was the end of Coastair and Westport has never been connected with a flight to Christchurch since. The final factor is Westport folk haven't always used the air services offered and ultimately this is the issue now. Capital Air Services pulled out of Westport in the 1970s because people were not using their service. 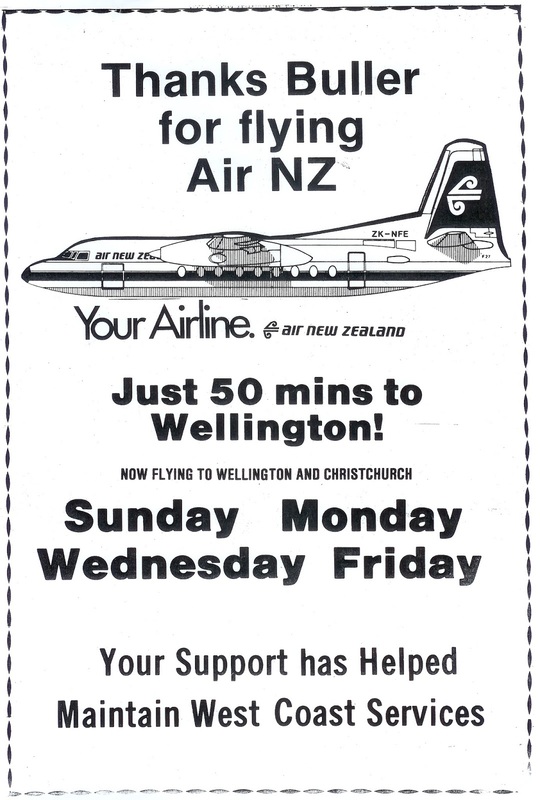 Air New Zealand's Friendship service through Westport was reduced to three flights a week in the early 1980s when people were not using it! Air New Zealand's current service uses aircraft that are getting older and therefore less reliable and are becoming increasingly uneconomic. There is nothing available to replace them other than upgrading to 50 seaters. If the economics don't stack up for current flights they are not going to stack up for Air New Zealand's Q300s. It will be interesting to see who picks up Westport how they open the next chapter in Westport's aviation history. Westport News, 4 April 1984 - This was after Westport regained a Sunday service... Before that happened the add used to say "Use it or Lose it!" Taupo has been named the hottest destination for backpackers - but good luck getting here from Wellington if you want to fly. At the same time Taupo was celebrating taking the title of the ‘‘Best New Zealand Destination’’ award at the Golden Backpack Awards, Air New Zealand made an announcement of its own, axing its Taupo to Wellington flights from April, 2015. From then Taupo customers will have to use the service from Rotorua, or connect from Taupo via Auckland, which would be the only direct flight left in the region. Mayor, David Trewavas, said he was "extremely disappointed" the service had been cut and expected there would be a flow-on effect from the decision, given Taupo’s position as a notable visitor and conference destination. ‘"Previous discussions had indicated this would be an issue we could face in five to six years time," Trewavas said. "Since I have been in office, I have been in constant contact with Air New Zealand and no indication had been given that this issue was on the immediate horizon ... it has come as a bolt out of the blue. We invest a large amount of money marketing ourselves as a visitor and events destination, and host a huge number of national and international tourists every year. You could forgive us for feeling as though we’ve been slapped in the face. Great Lake Taupo was announced as best New Zealand destination in the 19th annual Golden Backpack Awards, which will only lift our profile further. I would like to reassure our community that as a Council we will be working extensively with Air New Zealand to ensure our remaining air services are retained and that they will service our growing business community in the most effective way." Destination Great Lake Taupo general manager, Vanessa Freeman, said the Golden Backpack Award had demonstrated the quality of product the region delivered to both international and domestic visitors. "The recognition is a credit to the hard work our tourism operators put in 365 days of the year. With tourism being worth $400 million to this region, it is a significant industry that delivers both dollars and jobs for Great Lake Taupo." The suspension of the Taupo to Wellington flight, has left many locals wondering what the impact will mean for the region. Leigh Hynes said she flew the route "at least six times" a year and always saw a lot of tourists on them. "The flights always seem to be full to me and I see a lot of tourists on these flights, which means that there will probably be a flow on effect there." The Auckland to Taupo flight next year will move away from the 19-seater aircraft to the new 50-seater aircraft, which Air New Zealand said would "make tickets cheaper, which would then result in more utilising the service." However, some are questioning why the Wellington flight was cut without testing the market using the more affordable 50-seater aircraft, which Air New Zealand estimated would see ticket prices drop by around 15 per cent. Many of those who commented on the Taupo Times Facebook page, said the cost deterred them from using the service. Arran Knox said it was often cheaper to "fly to Rotorua and drive to Taupo." If the larger planes were used on the routes, he believed a reduction in fares would see more use the direct service. He said axing the direct flight would make it hard for him when he joined police college, as he would be based in Porirua for 18 weeks, separated from his partner and child. "Not having flights as an option is disappointing ... it probably will mean we will use Skype and less face to face." He also said it would "emotionally [be] much harder on [the] family", especially when he couldn’t make the trip. Air New Zealand chief executive officer, Christopher Luxon, said the 19-seat aircraft was the smallest in the Air New Zealand fleet and always had the highest cost. "This has led to Eagle Airways, which operates the 19-seat fleet, losing $1 million per month for the past two years, or the equivalent of $26 per oneway passenger journey." Eagle management, staff and unions are working to determine the future of the business. Once they have a proposal for the future of Eagle Airways, redeployment opportunities within the Air New Zealand group will be identified for staff who may be affected. Last week’s announcement from Air New Zealand that it was cutting a number of provincial services wasn't really a surprise. The pattern set with the withdrawal from Oamaru, Wanaka and Masterton looked set to continue as the airline started reducing its uneconomic Beech 1900 fleet. So the cessation of services to Westport and Kaitaia was not totally unexpected. Both ports received at most two flights a day. To service them with a Q300 would be a return to Friendship days with a return flight probably in the middle of the day and with this not being suitable for business traffic the service would soon become unsustainable. Likewise, I was not too surprised that Whakatane was dropped. Rotorua and Tauranga airports are only an hour’s drive from Whakatane. Nonetheless Whakatane is the most hard done by port going from four weekday flights to none! Taupo’s proximity to Rotorua might have been the rationale of dropping the Wellington-Taupo service or are Taupo passengers to Wellington supposed to fly via Auckland? With Wanganui’s proximity to Palmerston North I thought that it might also have been chopped but it survived along with Hokitika and Timaru. One wonders whether these three ports will generate enough traffic for the long term. Air New Zealand also announced the cessation of the Nelson-Palmerston North service and that the Hamilton-Palmerston North service would operate with a single Q300 flight each day. One wonders how long this service will last if the new schedule doesn't suit the business traffic. So what about the replacement air services? East Bay Aviation has announced its intention to operate Whakatane-Auckland services using a 12- to 14-seater aircraft. “We think we can operate that size aircraft quite economically so that’s probably where we would be heading.” East Bay Aviation intends to just operate a single sector – perhaps they could rename themselves Bell Air! Bell Air certainly had a loyal following from Whakatane residents and the size of the town with the right aircraft could conceivably be quite profitable. Sunair has also announced its intention to operate twice daily Whakatane-Auckland and Kaitaia-Auckland services. Sunair’s Dan Power told Whakatane radio station 1XX that it is interested in servicing Whakatane Airport with “a 12-seater Cessna Caravan along with ten Piper Aztecs.” Sunair already has a long history of operating an extensive North Island network and recently announced its intention to inaugurate Auckland-Great Barrier Island flights from Ardmore airport. To date Sunair has never operated a turbo prop aircraft. Sounds Air already operates an excellent service from across Cook Strait and from Wellington to Wanganui. They have recently announced the purchase of a fifth Cessna Caravan and the introduction of a new service between Blenheim and Paraparaumu. Sounds Air's managing director Andrew Crawford is in talks with authorities in Westport about flying a Westport-Wellington route and he indicated there was also potential for Sounds Air to pick up the Nelson-Palmerston North service and to fly a Nelson-Paraparaumu service. However, he also acknowledged that flying to Westport was complex because of mountains, weather and distance. Of course it is early days… One wonders whether Vincent Aviation would have put its hand up to operate some services if it was still operating. To date Air Chathams, Great Barrier Airlines, Fly My Sky and Inflite Charter have not put their hands up to operate a service. Certainly Air Chathams and Inflite Air Charter have the capacity to offer services with pressurised turboprops. So what will the various centres be looking for? Westport, Whakatane, Taupo and Kaitaia will want prime time services that will offer business people flights access to and from their towns to Wellington for Westport and Taupo and Auckland for Whakatane and Kaitaia. Whakatane is already used to such a service with an Eagle Air Beech 1900 overnighting there. Westport and Kaitaia's current flights are good for business people flying into the towns for the day but are not so convenient for those flying out. They too will be looking for an overnighting aircraft. But this means a plane sitting at Westport, Whakatane and Kaitaia all day. Whakatane might sustain additional flights to Auckland but I doubt Kaitaia and Westport would so this is not a good situation for prospective airlines. Similarly Palmerston North-Nelson and Palmerston North-Hamilton services probably need twice daily services at prime times to capture the business traffic. Then there are the other centres that get a much reduced Q300 service. Will there be a need for an early morning/evening return business flight for Timaru, Hokitika, Wanganui and Gisborne? And I really do believe a Masterton to Auckland and an Oamaru to Wellington could work if the airline concerned could offer a good business schedule with a Sounds Air type formula, that is, a very reliable airline with relatively cheap fares offered all the time. But with daily business schedules from these centres there is a problem… what would the plane do for the rest of the day? Aircraft sitting idle don’t make money and competing against Air New Zealand is not a wise option either. Sounds Air have proved Cessna Caravans are a good reliable platform for their short haul sectors. However, they are unpressurised and therefore they are not ideal for services to the likes of Wellington-Westport and Wellington-Taupo. Pressurised aircraft are generally more expensive to buy and have higher operating costs which, in turn, will mean higher fares. To pick up these routes Sounds Air might have to think of another type or alternately another operator might consider these routes. All in all Air New Zealand’s move raises opportunities for regional airlines to develop new services. But the history of NZ regional airlines is littered with companies that tried and failed. The airlines looking to offer replacement services will have a lot of homework to do over the next few months. The towns affected will need to be reasonable in what they expect while the airlines will need to be careful in what they offer. So these are my thoughts, what are yours??? More details of Sunair's new services to and from Ardmore have emerged with the publication of the company's latest timetable. The company will offer two flights a day from Ardmore to and from Great Barrier Island. 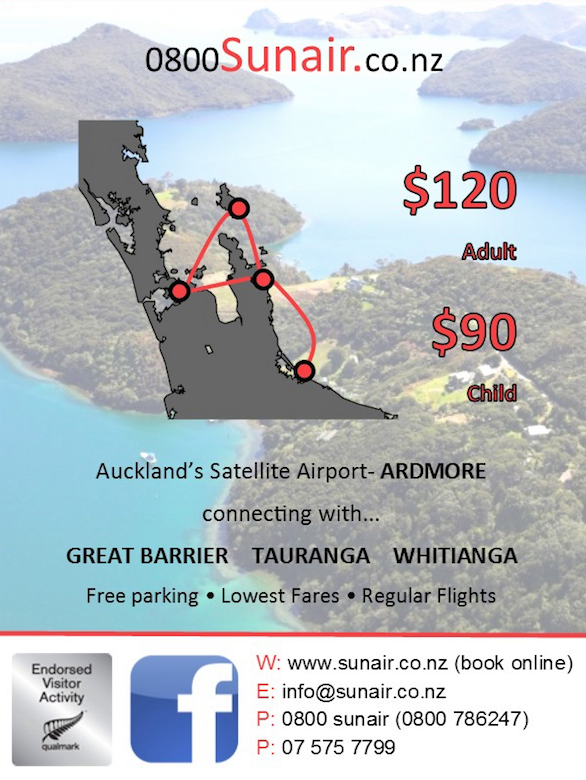 The advantage of the Sunair service is that there is free parking at Ardmore for Auckland passengers heading for the Barrier and and for Whitianga. Air New Zealand's review of its regional aircraft operations will cost Kaitaia its twice-daily service to and from Auckland. Whakatane and Westport will also lose their services. The cuts are designed to save the airline the $1 million it claims to be losing on regional services every month. The company has declined to tell Mayor John Carter how much Kaitaia was contributing to that loss. Chief executive officer Christopher Luxon said the airline had been looking at how to address the "poor operating economics" of its 19-seat aircraft while leveraging the significant economies of scale available from its 50- and 68-seat fleets. "The 19-seat aircraft is the smallest in the Air New Zealand fleet, but has the highest cost per seat to operate because the fixed costs of operation are distributed across fewer passengers. This has led to Eagle Airways, which operates the 19-seat fleet, losing $1 million per month for the past two years, or the equivalent of $26 per one-way passenger journey." It had also become clear that demand for seats was strengthening on some regional routes. The company had begun increasing seats in those areas, and would be accelerating that process with an additional $100 million investment in four new 68-seat aircraft. It would "exit" its 19-seat fleet by August 2016. "Our average regional air fare has fallen by 2 per cent over the past five years, and today's announcement will keep further downward pressure on regional airfares," Mr Luxon added. "On the 13 routes that will move from 19-seat aircraft to more cost-effective 50-seat aircraft we expect to deliver a 15 per cent average fare reduction." That, he said, was good news for towns including Kerikeri and Whangarei. The Kaitaia/Auckland service would end in April. Mr Luxon accepted that the news would be disappointing for some communities, but the airline remained "resolutely" committed to regional New Zealand, and the changes would set up its regional business model for future sustainable success. Federated Farmers' Northland president Roger Ludbrook has described the loss of Kaitaia's Air New Zealand service as "slamming another nail in Northland's coffin". "Kaitaia is a typical example of how National will not support Northland," Mr Ludbrook said. "I am sorry for Kaitaia, and sorry for MP Mike Sabin. He is a good man who has not been able to affect Air New Zealand's decision, because Northland National MPs have no power or influence in Parliament. "I believe this move by Air New Zealand is simply an example of what economist Shamubeel Eaqub referred to as 'zombie towns'. Kaitaia is just a provincial town that Wellington will allow to die, because they need the votes not from the provinces but from the urban centres. So that is where resources will be spent. "This move by Air New Zealand is a short-sighted tragedy, because New Zealand's spending is done in the cities, whereas wealth in this country is created in provincial townships like Kaitaia. "It will just make it more difficult for people to do business in Kaitaia and the Far North, meaning more businesses will leave and creating new businesses will become even harder." Far North Mayor John Carter was outraged, but was not yet despairing. The district council would urge the airline to reconsider its Kaitaia decision, and to recognise that the daily service was an important part of the Far North's transport infrastructure. "It helps keep Te Hiku Ward on the tourist map, and is a sign of confidence in our economy," he said. He was also disappointed that Air New Zealand told council representatives and MPs of its decision the same day it announced it to the media. "We have developed a good working relationship with Air New Zealand, which has delivered significant benefits to the district. It is unfortunate that we were not given a proper opportunity to work with the airline to fully explore options that could improve the viability of the route," he added. Far North Holdings chief executive Andy Nock said he believed the Auckland-Kaitaia service could be economically viable if a more efficient 50-seat aircraft was used and the first daily flights to and from Auckland were rescheduled to earlier times. He too was unhappy at the way the announcement was made. "Air New Zealand indicated to us some time ago that they needed to improve the commercial viability of this route," he said. "We had established a positive dialogue about growing the service on the back of tourism growth in the area. We are very disappointed that they have not been willing to take a longer-term view of this route, and that they told us about their decision after the press release was issued." Absolute disasterTe Tai Tokerau MP Kelvin Davis described the loss of Kaitaia's service as "absolute disaster". "Air New Zealand is sending a signal to the rest of the country that the North is closed for business," he said. "It does nothing to remedy an already tough economic climate in the North, and will make it even more difficult to attract investments in an area that is already suffering hardship. "Air New Zealand did not consult with the community on any changes. Its decision to generate profit for its stakeholders obviously outweighs any corporate responsibility it has for Far North communities," he added. Labour's transport spokesman Phil Twyford said cutting services in already struggling regions was a hammer blow for Westport, Whakatane and Kaitaia. The regions were being abandoned by the government at a time when falling dairy prices meant they needed help the most. "Now Air New Zealand is twisting the knife. Regional air routes are economic lifelines to these places," Mr Twyford said. "The loss of an air route to Westport, Kaitaia and Whakatane is cutting them adrift from the national economy." It was clear that this had been in the pipeline for some time, with exorbitant prices for regional fares a softening-up exercise, but the government was still the majority shareholder of Air New Zealand, and it was time John Key sat the board down and explained to them their duties as a national carrier, including providing affordable air routes to regional centres. Tauranga company Sunair Aviation Ltd. is offering to provide scheduled air transport from Kaitaia to Auckland on the withdrawal of Air New Zealand's service in April. Chief executive Dan Power said he was confident that the 25-year-old company could provide a safe and reliable service, given that it had been offering regional air links throughout the central North Island, accident-free, for many years. Sounds Air is looking at flying some routes Air New Zealand will ditch. The company has bought a fifth 12-seat Cessna Grand Caravan which leaves Oklahoma today for its 48-hour ferry flight to Blenheim. The additional plane comes as Air NZ conducts a regional shakeup including cutting its Nelson-Palmerston North service and stopping flying to Westport. Sounds Air managing director Andrew Crawford said it was talking with authorities in Westport about flying a Westport-Wellington route. He said there was also potential for Sounds Air to pick up the Nelson-Palmerston North service and to fly a Nelson-Paraparaumu service. Its additional plane is to fly a new service between Blenheim and Paraparaumu, and complement its existing fleet on flights from Wellington to Nelson, Picton, Blenheim and Whanganui. Crawford said the issue of flying to Westport was complex because of mountains, weather and distance. Flying from Nelson to Palmerston North was much more suitable for the company as it already flew Nelson-Wellington. It would look at flying Nelson-Paraparaumu in the short term. "If you get to Paraparaumu you are a long way up the coast so it is easier to get to places such as Taupo and it is a go-ahead area." Air2there also operates Paraparaumu flights to Nelson and Blenheim. Air New Zealand launched a service between Paraparaumu and Auckland in October 2011 and added a service between Paraparaumu and Christchurch in November last year. Palmerston North Airport's boss is vowing to bring direct flights to Nelson back because patronage is high and the service is a litmus test for route development. Air New Zealand announced this week that flights between Nelson and Palmerston North would be among five regional routes to be axed in April. Palmerston North Airport chief executive David Lanham said it was "disappointing" but called it a "minor blip" in the airport's regional routes growth plan. He said there was no forewarning from Air New Zealand. "It's just disappointing, we were very happy with the growth on the route." He said the Nelson route was about 5 per cent of the airport's traffic and they planned to get it reinstated. "We won't be giving up on getting Nelson back because we know a lot of our customers really enjoyed that service and patronage was really high. We're still very confident that we can continue with our route development plans." He said he would wait for Air New Zealand to address its issues. "Then we can get stuck in to Air New Zealand again for route development." The Palmerston North to Nelson route was re-introduced last year after a five-year hiatus. Massey University student Josie Weston travels home to Nelson during her holiday breaks. She said it was a "real shame" that the service would be cancelled. "Being from Nelson but studying at Massey in Palmerston North, it has been amazing being able to get home so easily. "I know a lot of students will be really disappointed with them not running these flights as of next year." There would especially be disappointment about "the increased cost we will now have to pay to get home for holidays and to see family". She said it would take three to five hours to get home once the flights were axed "instead of the easy 45-minute direct flight". "I have used the ferry a couple of times but just found it too long of a day, even though it is cheaper." Lanham said the Nelson route was important to the airport because it showed that Air New Zealand felt confident there was opportunity for regional growth. "We felt that that would mean they would be open to other new routes as well." Lanham had his sights set on building stronger links to main centres and other regions. He has been campaigning for direct flights between Palmerston North and Tauranga. "That's still on the radar," he said. "It's not a dead duck. Lanham was pleased with the news that Air New Zealand would be increasing the size of the carrier. He said the changes to the aircraft were good news as it meant a reduction in fares. Air New Zealand will move from 19-seat aircraft to a 50-seat Q300 aircraft on the Palmerston North to Wellington route and the Palmerston North to Hamilton route. Larger aircraft flying in and out of Marlborough Airport will result in cheaper flights for passengers. From March 2016, Air New Zealand will run a 50-seat Bombardier Q300 on its Blenheim to Wellington route instead of a 19-seat Beechcraft 1900D. Blenheim to Christchurch flights will change to the 50-seater aircraft a month later. Air New Zealand chief executive Christopher Luxon said passengers in and out of Blenheim would benefit from an average 15 per cent drop in fares because of the extra seats. "When there are more people on a bigger aircraft they share the costs, so we are able to lower the cost of the seat." However, flights in and out of Blenheim would be less frequent. Seven flights between Blenheim and Wellington each day would drop to four, Luxon said. The key times for businesspeople would remain, he said. The Blenheim to Christchurch route would make the change in April 2016 and daily flights would be cut from three to two. "We can't just make the change and keep the frequency," Luxon said. Air New Zealand already runs the 50-seater aircraft between Blenheim and Auckland, but would look at using the 68-seater on that route from August 2016, Luxon said. The frequency of the flights would remain the same. Eagle Airways would stop operating by 2016. Its Blenheim-based staff including aircraft engineers, administration staff and 22 pilots had an uncertain future. Luxon reassured the Express they were giving staff redeployment options. Eagle Airways employs 230 staff throughout the country. Marlborough Airport manager Dean Heiford said it was great Air New Zealand had identified the importance of the Blenheim to Christchurch and Blenheim to Wellington routes. "It's a huge increase and advantage to us, though it has come at a cost to smaller regional centres. So it's a bit bittersweet. "The only thing people need to realise is that they are trading capacity and price for frequency." Destination Marlborough general manager Tracy Johnston said more seats and cheaper flights was brilliant news. "It gives us better access in and out of the region to connect with the main centres where people are flying internationally. "We see it as a way of encouraging more people to come to Marlborough." Destination Marlborough and Air New Zealand teamed up earlier this year in an effort to boost the number of passengers into the region through joined campaign strategies. "I think we are very fortunate to be demonstrating such good demand in and out of Marlborough and that Air New Zealand has responded," Johnston said. "It bodes well with us and we will continue to retain and build that demand." Wellington-based Vincent Aviation is being sold by the receivers after the company hit financial turbulence last month. Receivers BDO said in a public notice that the "well established company" had a 20-year aviation history with an "impeccable safety record". They have called for offers for the business, which includes a Myanmar-based contract with leased aircraft and company employees based on site, on rotation. Offers are also sought for three key aircraft with opportunities to take an assignment of leases, or purchase the aircraft outright. Vincent also had a range of stock and tooling for J31 and J32 Jetstream aircraft, and the BAe 146, known as the Whisperjet. BDO said in the 2014 financial year Vincent had revenue of $7.4 million from existing contract charters. Former Aviation New Zealand chief executive Irene King was hesitant when asked if Vincent Aviation, which is in receivership and liquidation, would sell. "It's not a business that leaps off the page at you, but I guess there might be some interest." She said a factor affecting the sale would be details around the Myanmar contract. "How long does that contract have to run in Myanmar, what's it worth, and is that contract actually tied to Vincent Aviation?" It is understood the contract involves an aircraft in the Yangon region providing services to an oil and energy exploration company. King said the failure of Vincent Aviation "was a shame" as it had an impeccable safety reputation and record. "It used to get stellar results from its regulatory audit. That has much to do with the management, systems and processes. "But there is a difference there between delivering impeccable regulatory results and remaining viable in the industry." Vincent Aviation was put into receivership last month after its subsidiary Vincent Aviation Australia, based in Darwin but owned by Vincent Aviation in New Zealand, went belly-up. The Australian business, although a subsidiary, was much larger than in New Zealand and its debts came back to the New Zealand business which it could not handle. Vincent Aviation's wings were clipped after 24 years in service, and more than two million passengers. Sounds Air to fill some gaps?